Kunda Dixit, editor of the respected weekly Nepali Times, wasn’t at work on the afternoon of 25 April. It being a Saturday, he and some colleagues were enjoying a day away from work, hiking in the mountains that surround Kathmandu. Across Nepal, millions of people did precisely the same thing and, within minutes, sent messages across the world. It is now recognised as a primary instinct in a crisis: the need to reach out, to establish contact, to make a call. Are you OK? What just happened? What do we do now? Where can we get help? Nepal is proving yet again just how important communication is to disaster survivors. 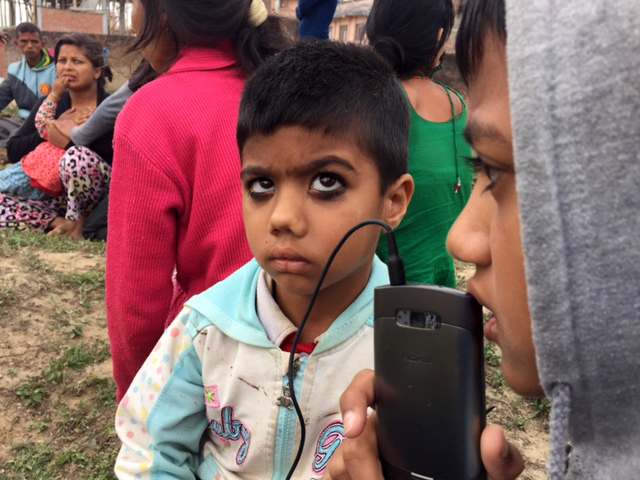 Images of Nepalis charging their phones on the street, listening to the radio, sending an SMS even while lying injured: that this is an operational priority for the survivors of this quake is already clear. Across the world, meanwhile, Nepal’s massive diaspora has turned to social media in an effort to track down loved ones and organise their own responses. Facebook groups have proliferated – one of them, Stay Strong Nepal, has more than 150,000 members. “This is when you realise the importance of Twitter! When you are far away and you get the information needed!” tweeted Kathmandu resident Pallavi Dhakal who was in western Nepal when the quake hit. She used the micro-blogging platform to track down friends, share emergency contact numbers and to thank Skype for allowing free calls for Nepalis. Others, especially outside urban areas, are turning to more traditional platforms like radios to find out where to get food, which hospitals are open, and how to deal with an aftershock. The need to communicate - and the idea that information is a form of assistance in its own right - is increasingly acknowledged as an urgent but under-supported aspect of disaster response. This point was stressed in the 2005 World Disaster Report produced by the International Federation of Red Cross and Red Crescent Societies, which stated that information is as important as food, water and shelter as a form of aid. Organisations like Internews, BBC Media Action, the CDAC Network and many others have worked to make this an operational reality. This time, the international community has been faster than usual to respond. BBC Media Action, which has long worked with community radio in Nepal, went on air with their first Lifeline programme for Nepal – designed to provide useable information about the emergency – within 10 hours. The UN’s humanitarian coordination body, OCHA, has also sent a communications coordinator to Nepal as part of the first response team, and assessments of local media capacity will follow in coming days. Sector updates are being produced by the CDAC Network, available from their website. Tools like the message library, an online bank of approved safety information and advice, are available for all. Nepal is also showing just how much digitisation is changing communications in disasters. Kunda Dixit and many others have been tweeting images and updates from the ground since the first hours. Many have used the platform to criticise the government, contact the authorities directly and share requests for help. Nepalis overseas are joining online volunteer efforts to translate information and map affected areas. Local newspapers continue to publish online, even while they struggle to print and distribute their traditional hard copies. The silence that emanates from areas cut off from communication, especially in the areas near the epicentre, is a profoundly ominous indicator. And communication will only become more important in the days to come. As Tomlinson points out, some of the worst affected areas take days to reach even in normal times. •	Get the phone networks working. Mobile is now the most important communications tool most affected communities have access to. Provide free charging. Offer fuel for base stations to keep services running. Help phone companies get their engineers and kit to where it needs to be. Increasingly, with the development of mobile money, it could also become a way for them to access cash. Help people talk to each other – that way they can connect to their networks and organise their own responses. •	Assess information needs and channels. You can’t communicate unless you know how people like to get information – and guessing doesn’t work. In Haiti, one of the poorest countries in the world, aid workers were surprised to find that 80 percent of people nevertheless had mobile phones. •	Help local media do their job. For many in rural Nepal, radio is their sole link with the outside world. Local journalists are also first responders and providers of information: help them become operational again. In Nepal, stations outside the capital have been badly damaged or destroyed, while in Kathmandu, those that are functioning are using generators that are running low on fuel. Provide them with diesel to keep stations on air. Don't trample them in your rush to get to CNN. Give them access to senior leaders of aid organisations. Have a local spokesperson fluent in the right languages. Distribute newspapers with aid packages. •	Listen, as well as talk. Messaging – just talking at people – is ineffective and often patronising. Listening is crucial. In Nepal, rumours are circulating of another major quake, causing people to panic. Picking up on that, BBC Media Action and others have been broadcasting the simple fact that all earthquakes are impossible to predict. In Haiti, having a local staff member tasked with engaging local populations helped the World Food Programme find out that people were selling and forging their vouchers. It was then able to redesign them. •	Be ready to explain who you are and what you are doing. Face-to-face communication is always essential: make sure local staff are equipped to answer questions about your agency, projects and mandate. And give local staff ways to feed back what they are hearing to their managers. Organisations that don’t do this can face a serious backlash, like the NGO in Haiti whose cholera treatment centre was burned down by the local community. Imogen Wall has worked on the front line of responses in East Timor, Indonesia, Sudan, Haiti and the Philippines and is also a survivor of postings in New York and Geneva. She specialises in communications, advocacy, engagement with affected communities and dissent. كلما سمعت ريتا دانوار، البالغة من العمر 65 عاماً، صوت سيارة تندفع هي وجيرانها نحو الطريق على أمل أن تكون المساعدات قد وصلت في نهاية المطاف إلى بانغار، وهي قرية نائية في منطقة كافري في نيبال.